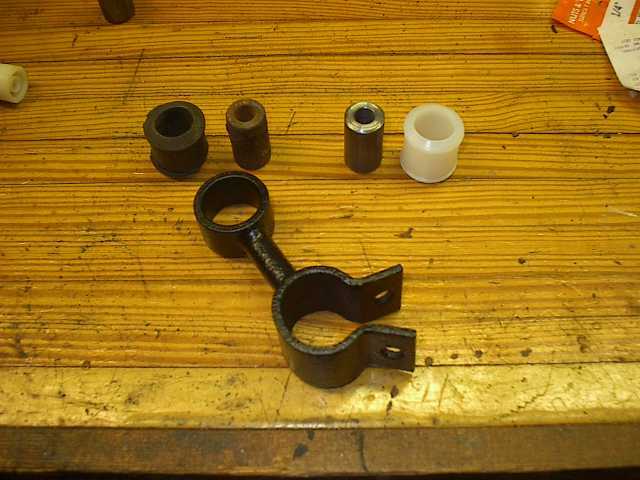 The Corvair cars have the following places where rubber bushings are used in the suspension. I've noted the bushings that have to twist, rather than simply rotate around the hole, you do not want to use the commonly available nylon bushings in these locations since they will bind the suspension. In most cases, this will eventually fatigue the mounting brackets (the rear lower control arm brackets are especially likely to do this). Since I created this page, many new bushings have become available. In particular, Bob Coffin offers front delrin bushings, and the Corvair Underground has a complete line of polyurethane bushings for the control arms. For a car that's to be driven on the street at least some of the time, I'd go with the poly bushings rather than delrin or nylon. Delrin would be the choice for a autocross and track duty only car. If you are building a dedicated track car and it's legal for the class, the ideal solution is to use Heim joints, since they can both rotate and twist. See the Stinger Prep Manual for details. Bear in mind that any non-rubber bushing will require maintenance, you must lubricate them regularly. If you want to put a Corvair together and forget about it, the rubber bushings are the way to go. Even new rubber bushings are a significant upgrade from rotten 40 year old ones. Lower control arm. Twists. Bob Coffin has a chamfered delrin bushing. Corvair Underground has polyurethane. 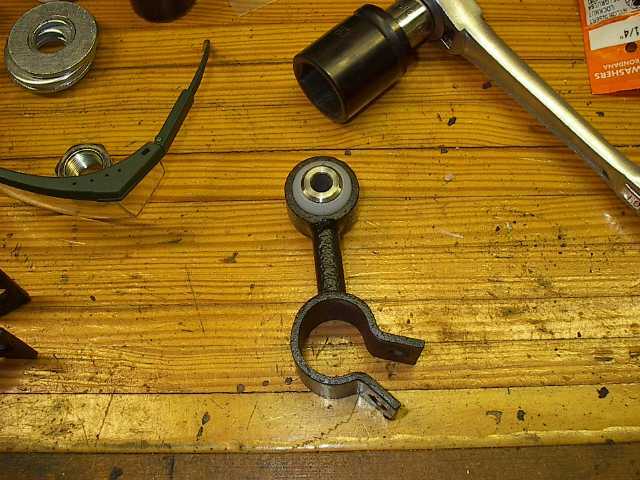 Brake reaction rod. Twists. Corvair Underground has a polyurethane set. Moog has a heavy duty bushing, available from most Corvair suppliers. Upper control arm (2). No twisting, use nylon, delrin, or poly (Underground) bushings here. End of sway bar. Twists. Corvair Underground has a stiffer rubber bushing. Inner sway bar (dogbone). Corvair Underground has a stiffer rubber bushing for the sway bar, Clark's has nylon bushings for the top. Installation of the nylon upper bushing. The old rubber bushing is in the first photo. You can use this technique with a big bolt to install any of the bushings that fit in an eye. Shock absorber top (pin). Use generic poly sway bar end link bushings. Shock absorber lower (eye). No suggested replacement yet. Pitman arm to center link. Most vendors have nylon or delrin ones. Semi trailing arm. No twisting. Corvair Underground has a polyurethane set. Shock absorber top (pin). Corvair Underground has a polyurethane set, or use generic poly sway bar end link bushings. Trailing arm. Twists. Corvair Underground has polyurethane. Front toe control link. 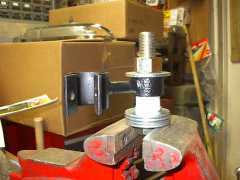 Use generic poly sway bar end link bushings. Lower control arm (2). Twists. Corvair Underground has cast in place polyurethane ones (choose the stiffer of the two varieties), or use 1 nylon inner and 1 rubber outer bushing. Although not exactly a suspension bushing, there is a rubber bushing in the "horsecollar" that the transmission bolts to. Corvair Underground has a polyurethane replacement.